Gibson Style A-4 Snakehead Model Carved Top Mandolin (1924), made in Kalamazoo, Michigan, serial # 75907, red sunburst varnish finish, birch back and sides, spruce top; mahogany neck with ebony fingerboard, original black hard shell case. This 1924 Gibson Model A-4 is a spectacular example of the company's craftsmanship at the apex of the mandolin era, just before their focus shifted to banjos and then guitars. These "Snakehead" instruments are revered for their unmatched tone and projection and have all the most advanced features of the era, including the adjustable truss rod, raised adjustable bridge, and slim neck profile. 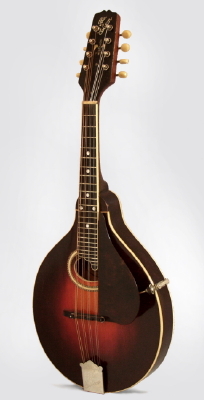 The A-4 with its extra inlay and beautiful red sunburst top was Gibson's highest grade mandolin in the round-bodied A series; only the elaborately scrolled F-2, F-4, and F-5 were priced above it. Lloyd Loar's tenure as "acoustic engineer" at Gibson has become so mythical that sometimes separating fact from fiction is difficult. Certainly the mandolin family instruments made during the period of Loar's employment are the most perfectly realized in Gibson's history, and have become the template for most similar instruments since. The mandolins of the "Loar Era" show the influence of a master player on both design and execution, although other Gibson employees (especially Thaddeus McHugh and Lewis A. Williams) actually engineered many of the technical improvements of the early 1920's. Loar was primarily concerned with "voicing" the instruments properly; the Master Model Style 5 line was his greatest contribution with their violin-style f-hole tops, but all Gibson mandolin family instruments were refined and improved at the same time. This A-4 dates to very early in 1924, the last year of Loar's employment at Gibson. This A4 is a truly lovely instrument to behold. The sunburst top finish is especially bold, and even the fleur-de-lys inlaid in the peghead is made of unusually fine green abalone. The neck is a very slim rounded "V" profile and extremely fast and comfortable. This rates as a fine-sounding and playing mandolin by any standard, simply one of the best "A" models we have ever heard with the combination of power and complexity found only in the finest Gibsons. Overall length is 25 3/4 in. (65.4 cm. ), 10 1/4 in. (26 cm.) width, and 1 3/4 in. (4.4 cm.) in depth, measured at side of rim. Scale length is 14 in. (356 mm.). Width of nut is 1 1/8 in. (29 mm.). Very clean all-original condition. There is minor finish wear with some dings and scrapes overall and one bigger ding to the top above the fingerboard; otherwise, mostly noticeable on back. The plating is still amazingly shiny and the finish is deep and rich. The bridge top currently fitted is an exact Siminoff reproduction, but the original (which has a small crack on one side) is included. This is a particularly fine example of a rare and sought after mandolin, complete with the original HSC. Excellent Condition.